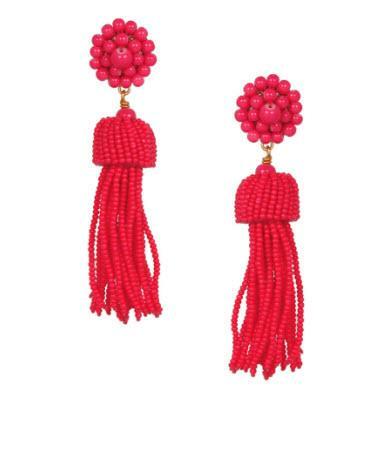 Be perfectly pretty in pink with these fabulous in these miss pink tassel earrings! Designed by one of our newest designers Lisi Lerch, who has been in fashion blogs and magazines, really puts her own spin to make these truly a high end quality statement piece! These tassel dangle earrings are made with tiny glass beads that create multi tassels off of a larger circle beaded post. Add a pop of color to your everyday look or they are great for parties! Please choose either clip or post for your earrings. Sometimes these earrings are slightly heavier and the clips works much better. This is my opinion since I wear these all day and often.. I like the clips personally even though I have pierced ears.